Shop one of our most popular trophy series. Our exclusive Wilson Trophy Series – Baseball and Softball trophies are available in three different sizes – 11.5”, 12.5”, and 13.5”. Perfect for each member of your team or each winning team in the tournament. Next, select if you would prefer the entire year for the Right-Side Trim or just the last two digits. Finally, completely customize the trophy by selecting from over 20 different figures for on top of the trophy. 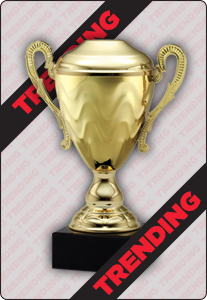 Completely customize your award by engraving.